Sometimes when a door opens, you never know where it’s going to lead. In Bellevue, Washington, there’s one door that leads to an experiment in international entrepreneurship, an academic program intertwined with business and tech industries to come up with solutions to worldwide problems such as health, sustainability and social innovation. Such an auspicious opportunity came to life in September, when the new 100,000 square-foot, state-of-the-art Global Innovation Exchange opened its doors. Among the graduate students who stepped through those doors is someone who started his first non-profit when he was 17 to help victims of flooding in Pakistan, an industrial designer working on a device to keep women safe and a former collegiate golfer inspired to help his homeland develop better infrastructure to deal with disasters. GIX has begun with a cohort of 42 graduate students in their 20s and 30s who hail from 11 countries, including China, Russia, India and the United States. Their backgrounds reflect the diversity of their interests: computer science and electrical engineering, as well as photomedia, design, social entrepreneurship, business and physics. One of them biked across Beijing just to meet locals before the orientation in August for all incoming GIX students at Tsinghua University, while another taught biomedical engineering in Ethiopia (in the first program of its kind in that country). Over the next 10 years, GIX has the potential to educate 3,000 learners, including senior managers who would attend for executive training and education. To get the word out about GIX, the GIX Innovation Competition drew a global mix of young innovators. The contestants’ imagination and ingenuity concentrated on connected devices, which is also the field this first GIX degree (the Masters of Science in Innovation Technology) is focused on. 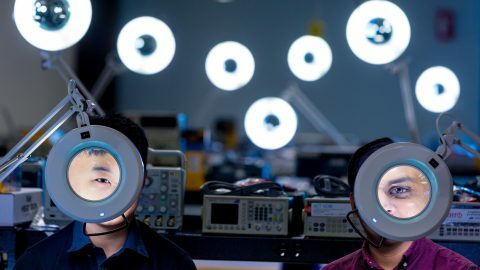 Their original projects involved technology such as the Internet of Things (IoT), wearable devices, intelligent hardware, virtual reality, augmented reality, intelligent sensors and much more. One pocket-sized device scanned the caloric content of food, as well as its freshness. Another project proposed a robotic guide dog for the seeing-impaired. Also included was a mobile air filtration device, inspired by the persistent pollution in Beijing. Such projects reflect GIX’s global focus, which is on team-based, experiential learning connected to many industries. In 2015, Microsoft donated $40 million toward GIX as an innovation-focused graduate school and the first physical presence of a Chinese university in the U.S.
One of those emerging innovators is Talha Sabri, 24, from Karachi, Pakistan. When he was 15, Sabri created an event management company that hosted screenings, soccer tournaments and various school-related occasions that ranged from 100 to 600 attendees. When Sabri was 17, he founded the Nixor College Flood Relief Drive in August 2010, just after the July floods in Pakistan that displaced 20 million people. In less than two weeks, volunteers from the drive raised 2.5 million Pakistani rupees by standing at traffic lights and in shopping plazas. The relief drive integrated with Nixor Hospital and Sabri took on the role of chief operating officer, organizing 14 free medical camps in remote villages in Southern Pakistan that were most affected by the floods, treating more than 12,000 patients. At Hampshire College in Amherst, Massachusetts, where he was a student, he focused on how new media and emerging technologies are shaping social development around the world. He studied sustainable economic development and social entrepreneurship. After that, he became inspired by and visited the local chapter of The Impact Hub, a global network of co-working spaces dedicated to social entrepreneurs, investors, creatives and technology-driven people who are striving to have a positive social impact on the world. He moved back to Boston in April and started his company, tPot Labs, at the Impact Hub there. He’s even recruited five people enrolled at GIX to work in his company. They are from Russia, USA, Taiwan, Germany and Pakistan. The company has designed Herbot, a mid-size automatic countertop hydroponic system, with a full suite of IoT technology and a smart app that makes growing produce in your home as easy as brewing a cup of coffee. They are also in the process of designing Herbtainer, a low-cost solar-powered shipping container turned IoT-automated farm. “Our hope is to work with international-governmental agencies and local nonprofits and ship Herbtainers to the most vulnerable communities around the world, such as the Syrian refugee camps in Jordan and African-American and Hispanic communities in Brooklyn, New York,” Sabri says. Sabri made his product prototypes using wood, a more sustainable, biodegradable alternative to plastic. In Pakistan, he engaged carpenters to help him. But here at GIX, he’s doing it himself, getting hands-on training through the program. And he’s doing that on the second floor of the GIX building. The makerspace is 33,000 square feet of desks, open space and equipment for students to start to bring their projects to life. Close to the stairs, there’s a nod to the fundamentals of creation: a wooden dinosaur, the unofficial mascot of this first GIX cohort. His name is “GI-reX.” He was made on the ShopBot CNC router and he stands about 8 feet tall. This is the fun floor, obviously. If you like to tinker, this is Wonderland. There’s an enclosed woodshop with traditional machines, the kind of room where you need to wear safety goggles. Outside of that, there are sewing machines – also another fundamental, but necessary to create embedded electronics and smart fabrics. But there are also high-end 3D printers and Glowforge laser cutters, with materials free for the students to create prototypes of their ideas. Power outlets hang from the ceiling, ready for students to plug in wherever they need to, as all the tables are on wheels for them to move as they see fit. Zoe Zou, 28, moved to the U.S. 10 years ago to attend Arizona State University, where she received a Bachelor of Science in Industrial Design. Back then, the Beijing native experienced a strong culture shock. Passionate about fitness and wellness, she’s working on a project to empower and protect women around the world, especially in developing countries. It’s still in development, but right now it consists of a wearable device and an app. Her team is aiming to design a device protect women’s safety and the same core technology can be developed into another device with a focus on people especially women’s physical and mental health. She says design thinking classes allow GIX students to go out to the real world to discover unmet needs and validate every step of the way, entrepreneurship class teaches them to think holistically about the business side of an idea or solution and programming class gives them the necessary technological tools to realize software features. And the makerspace provides equipment to rapid-prototype concepts. “I feel GIX inspires students to take risks and think creatively to solve problems with cutting-edge technologies,” she says. Yifan Liu, 25, also came to the U.S. from China (Guangzhou), but as a high school student. A top amateur golfer in his native land, he traveled to South Carolina to pursue more opportunities in the sport. Eventually, he would land at the University of Washington and play on its golf team. Although he’s not pursuing golf professionally, the competition has taught him how to perform better in high-pressure situations and effectively manage his time. He majored in Photomedia in the university’s art school, creating video installations. He graduated in 2016 and stayed in Seattle, working remotely as a designer and multimedia specialist for a China-based company called PAIF that focuses on patent technology. He still works there part-time. Growing up in China, he was familiar with Tsinghua University and decided to apply to the 15-month MSTI program at GIX. While he grew up in what he called a place of privilege, a city with infrastructure, he saw typhoons decimate other cities in his region, and he wanted to help areas like that be better prepared when future disasters hit. Now at GIX, his group is designing a nutritional health solution for kids. GIX has two graduate tracks: a 15-month Master of Science in Technology Innovation (MSTI) degree from the University of Washington and a 21-month dual degree option, which combines the MSTI with a Master of Engineering in Data Science and Information Technology (MEDSIT) degree from Tsinghua University in China. While it’s become so easy in today’s high-tech world to reach out to others who live thousands of miles away, the world has also never been more divided. Programs like GIX aim to close the gaps of understanding. One of those bridges is a living, breathing reminder of the potential of the program. Behind the GIX building, a Dawn Redwood tree is growing. It’s very young and thin but already about 10 feet tall. Its needles are sparse, but it’s also fall. Come spring, it’ll be green again, its branches stronger. It’ll grow at least another five feet. When it matures, it could be as high as 100 feet. During his visit to Seattle in September 2015, Chinese President Xi Jinping gave the tree to GIX as a gift, a blessing for future success and a symbol of renewal for the groundbreaking of this new program that crosses all kinds of borders. “It is one of the few projects that I’ve had the opportunity to work on where I’ve felt, at the end of the day, that 100 years from now, if we do our work well and we’re a little bit lucky, people will look back and say, ‘What they did made a difference, and it’s a difference that’s continues to pay dividends a century later,’” Smith says.